Malcolm H. Brown joined the firm’s Bismarck office in July 2013 as an Of Counsel Attorney. He was born in Duluth, Minnesota, and raised in Jamestown, North Dakota. He received his undergraduate degree in 1964 and his law degree in 1967 from the University of North Dakota. Malcolm maintained a private practice in Mandan, North Dakota, from 1967 to 1994. He then moved his practice to Bismarck, North Dakota, in 1994 until joining Crowley Fleck. Malcolm has received an “A” rating by Martindale-Hubbell for the last 25 years. He has also been listed as a “Super Lawyer” of the upper midwest and listed in the Best Lawyers in America. 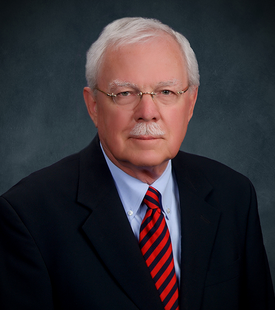 His practice areas are commercial law, real estate, eminent domain, estate planning, and probate. Over 40 North Dakota Supreme Court decisions and over 10 8th Circuit Court of Appeals decisions.